ABOUT: Probably the main and easiest lookout from Narrowneck down into the Jamison Valley and it provides a great view of Landslide cliff (aka Dogface) on the left with a distant Mt Solitary ahead and a sweeping Narrowneck ridge around from the right. Although with good clouds it is a slightly SE facing ridge and so sunrise is a good possible it is much better at sunset when Dogface glows red in the fading light, and with clouds around offers great potential. PHOTO EQUIPMENT TO BRING: A short walk so big tripod is possible, and ultra wides are best to get a view similar to the above shot, this is 17mm. Real potential for vertical panoramas using a 35 or 50mm and definitely worth bringing graduate neutral densities as the valley floor spends a lot of time in shadow during the golden hours. GETTING TO THE SPOT/S: Drive down Glenraphael Road for about 1 minute only, and park on the left next to the crash barrier, which is the 2nd small shoulder on the side of the road. The trail begins about in the middle of the barrier, just to the right of an upright, it can be easily seen. Hop over the barrier and walk downhill for about 5 mins, be careful of the edge at the end if going in darkness before sun up or after sundown. 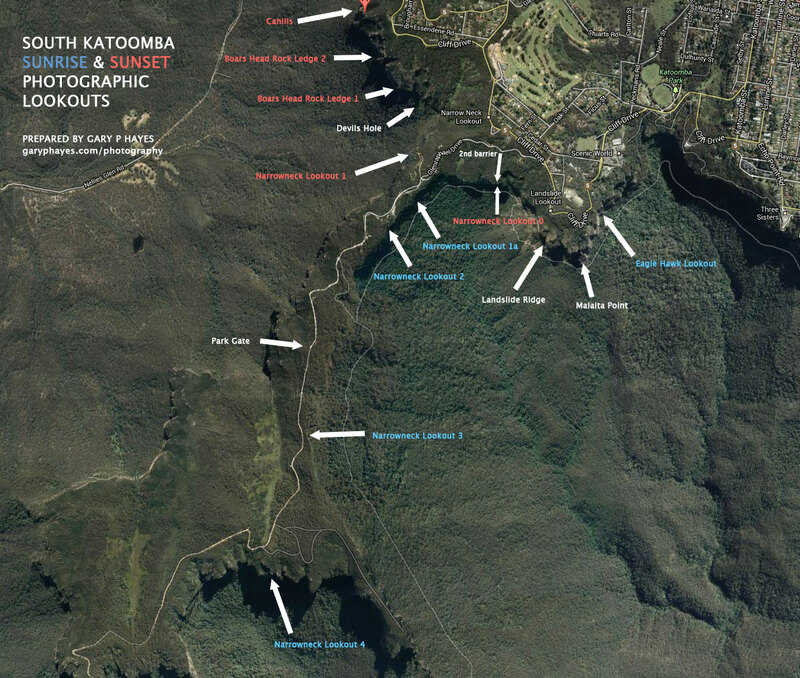 On the map below, Lookout 0 is not marked but it is more or less just below and opposite the marked Narrowneck lookout car loop.